Synonymous with luxury, caviar is both prized and misunderstood. Because it's so expensive, people don't want to waste it—but they also often don't know how to serve or eat it properly. The majority of caviar comes from three types of sturgeon: beluga, sevruga, and osstreta. If the eggs come from a type of fish other than sturgeon, like salmon, it's not really caviar—it's roe, the generic name for fish eggs. The finest caviar should taste neither fishy nor overly salty. When buying, look for shiny, fine-grained egg globules that are sturdy and unbroken. 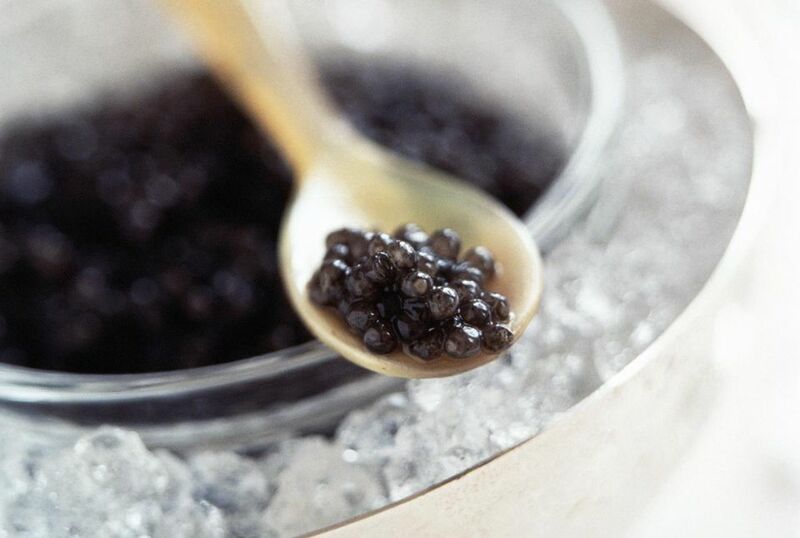 Fine caviar should be served very cold in a non-metallic bowl nested inside a larger bowl filled with ice. Caviar doesn't freeze until it's below 28 degrees, so you can store it in the coldest part of the fridge to get it as ice-cold as possible without it actually freezing, which can affect the texture of the eggs. Avoid metal bowls and utensils, which may impart a metallic taste to the caviar. Choose servers and utensils made of glass, bone, tortoise shell, wood, plastic, or to be truly traditional, mother-of-pearl or gold. Fine caviar is best served simply, possibly alongisde toast points or bland, unsalted crackers. Some people even like to eat it straight out of the tin the caviar came in to get the true, unadulturated taste of the fish eggs. Although purists will disagree, believing nothing should interfere with the flavor of fine caviar, common accompaniments include lemon wedges, sour cream, creme fraiche, hard-cooked egg—yolks and whites chopped separately—and minced onion. Oftentimes, caviar is served on a small pancake known as a blini. Lesser-quality caviar products may well benefit from these garnishes. If you're new to caviar, start by tasting it without any accompaniments to get a true idea of the flavor. Purists will also disagree with the commonly preferred libation of Champagne, and demand only a straight shot of the finest frozen vodka, preferably Russian. The neutral taste of high-quality vodka won't sully the flavor of the caviar. If you decide to go with Champagne, choose the driest version possible—but not the bottle with "extra-dry" on the label, which is actually sweeter than "brut," "extra brut," or "brut natural." When you're around friends, you might not have to worry too much about how to eat caviar with proper etiquette. However, if you're at a fine-dining restaurant, you might want to follow proper protocol. Don't eat too much when served caviar as an hors d'oeuvre, no matter how much you might be tempted by its luscious flavor. It's considered gauche to eat more than an ample serving of about 2 ounces, or about two spoonfuls. Don't chew the caviar, as you will lose a lot of the flavor. Use your tongue to feel the beads of fish eggs and taste the buttery fat. Take small bites of the caviar. It's an expensive product, and it should be savored and enjoyed, not scarfed down. Start with about a half-teaspoon and really luxuriate in the experience of eating the caviar.